Most days I look at the BBC website. This week I found theyve started carrying advertising. But not any old advertising… no less than adverts saying that flying Airbus is the greener thing to do. See the screen shot below at the foot of this posting. The inaugural flight was from Singapore to Sydney. I didnt know you could drive. Perhaps Toyota brought out an amphibious Lexus while I wasnt looking, complete with storage tanks for weeks at sea. 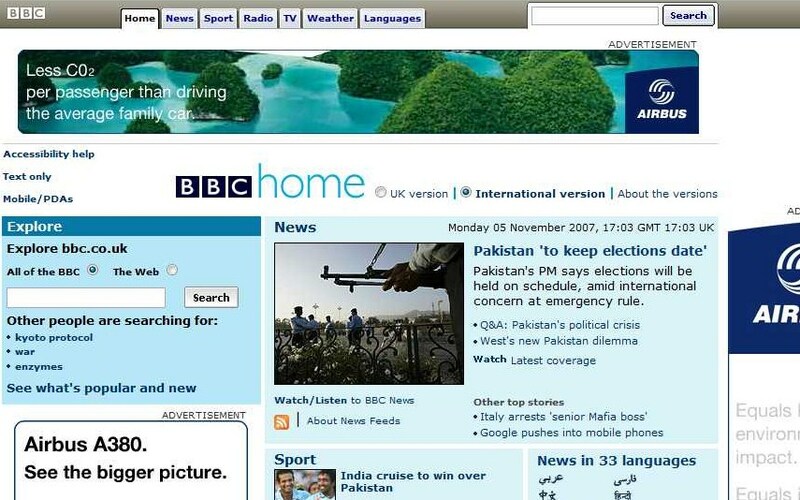 I would welcome your advice, as the contact on the BBC website for global advertising. Do you check the scientific credibility and clarity of the claims made by advertisers on your website? a) the specific text and general spirit of the BBC Charter. c) a coherence between editorial and advertising, given the current climate change programming on BBC World. I copy this to colleagues who are interested, as well as Simon Derry at BBC Trust and Kevin Marsh of the BBC college, who presented this summer at a UN event on media responsibilities. Although I realise you must be getting many questions on this matter at this time I would welcome an answer that is specific to the issues I raise. Please note I will be posting this email and your reply on my personal and company blogs, and including it in my column in the academic journal I mention above.